In her community, she was awarded first place in the Yom HaShoah Creative Arts Contest for her Holocaust remembrance poetry in both 2013 and 2014. This summer, she was offered two fully-funded scientific research fellowships, one at Florida State University, and one in nanotechnology research at the University of Mississippi. However, due to conflicting schedules, she chose to participate in the Young Scholars Program at FSU to do bioinformatics research. The Young Scholars Program (YSP) is a residential science training program for the top 40 high school juniors in the state. 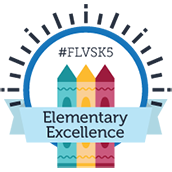 She was the only homeschool student to be selected for the program this year, and she credits her academic credentials to being actively involved at her FLVS clubs and classes. She participated in three YSP classes: biochemistry of the gene, math modeling, and advanced computer science. She wrote a research paper on the project her team completed on single nucleotide polymorphism calling in three European water frogs. She assembled a reference transcriptome using various digital tools and looked for evolutionary relationships among frogs. Upon completion of the project, she and her research partner presented a poster at the capstone poster session to various faculty members at FSU and in the Tallahassee area. 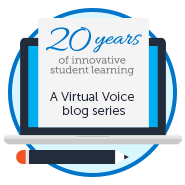 When students are homeschooled, a common concern is that they will not have as much interaction with their peers. Samantha has proven that wrong in her club involvement for sure! She started with newspaper club in 2009 and since then has joined the literary magazine team of VIRGE, yearbook staff of Unbound, and academic clubs such as National English Honor Society, Peer Tutors, Model United Nations, Science Club, and Math Club. She has been Editor-in-Chief of newspaper club for the last two years and has had the opportunity to go to journalism conventions, as well as compete in statewide and national contests. She also has also been an officer in National English Honor Society for three years and holds leadership positions in Unbound and Model UN. Now, she is on the Student Council and is hoping to bring back the book drive for the third year at Club Day 2015! 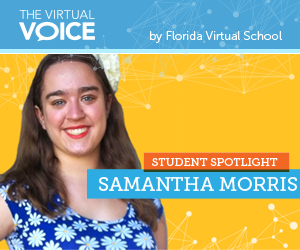 Samantha is an avid supporter of FLVS and attributes so much of her success to her studies with the school. We are grateful to have you, as well, Samantha! This entry was posted in Homeschool Edition, Parent Edition and tagged Clubs, Homeschool, Journalism, Leadership, Motivation, Student Activities, Student of the Year, Student Spotlight, Student Success, Support, Yearbook on December 5, 2014 by Guest Blogger. great job this girl she got student spotlight!!!!!! Amazing job Samantha! I’m rooting for you! I know that you are already successful now, but I believe that your success will go SO far in the future. Just remember: Always stay positive and good things will come to you. You go girl! Samantha was one of our Peer Tutors. She did a fantastic job. Congratulations to her on this feature and a start to a highly successful professional life.